There’s something for everybody at Essentials on Route 302 in Raymond. The new store, featuring unique gifts of every type, opened May 1. The store is modeled after Meyer’s favorite store in Rangely, she said. “I had a vision a couple of years ago. We need something like this in this area,” she said. 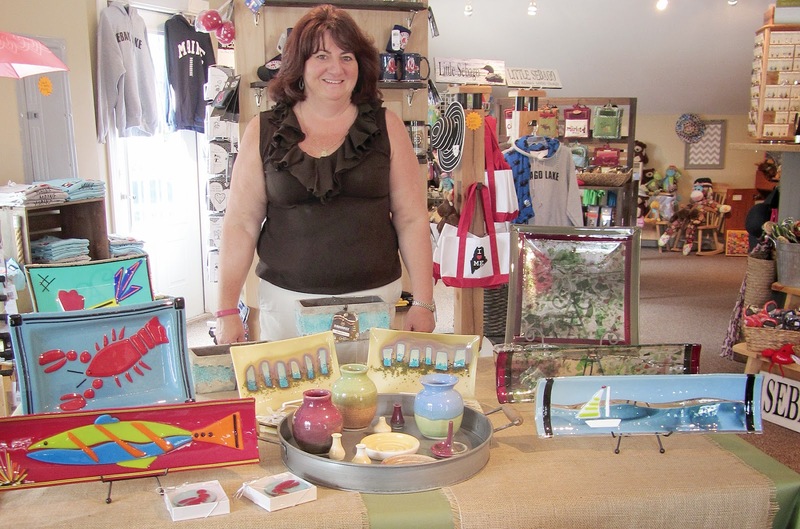 She wanted to have a place that she felt comfortable in, that wasn’t too cluttered and had unique Maine items as well as things like decorative pillows, glassware, WoodWick candles and sports memorabilia. 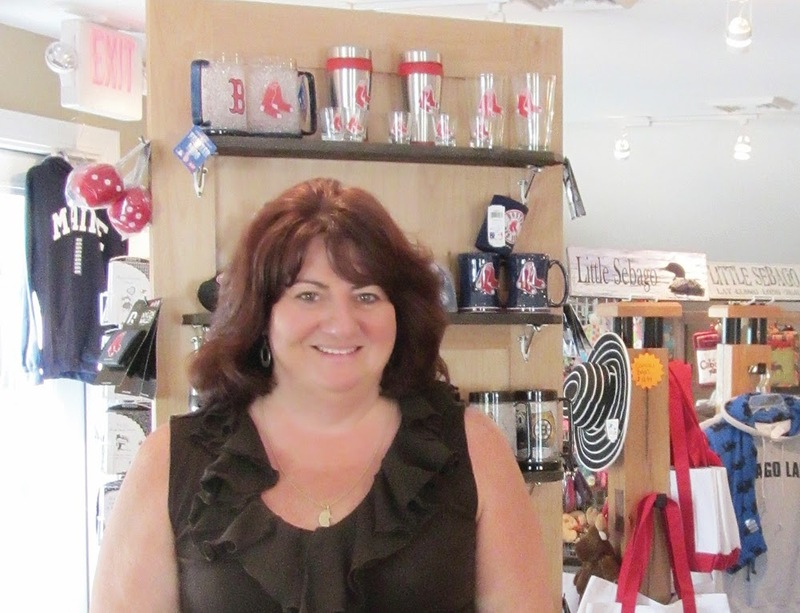 “I wanted to be a go to store for gifts without having to run to Windham,” Meyer said. There are unique hats and bags as well as Vinrellas, which are umbrellas that come in thin wine bottles meant to be used to store the umbrella wet or dry. Maine photo cards by Bruce Small and sweatshirts and T-shirts are also available. There are puzzles and games for children. There are dog toys created by a local teenager and treats for four-legged friends. The shop offers Chrysalis jewelry that resembles Alex & Ani bracelets and custom-made jewelry from local craftsmen. Meyer carries custom-made Maine pendants made with silver from a woman in Scarborough. These pendants were made exclusively for Essentials. Where can you find artwork from a local teacher? Essentials carries pottery from an RSU14 art teacher. Meyer’s first purchase for the store was from a company called Paint the Town. “I knew what we liked when we went away,” she said. The store has been described as The Cry of the Loon for young people,” Meyer said. Don’t need those kinds of gifts? The store also carries three different lines of skin care products, like Green Koala. Food items like old fashioned candy and Fennelly Farms jams can be found in the store. Meyers worked for her husband in construction doing paperwork while she raised her two children, one who is 23 and one who is 14. Her husband encouraged her to do something to make her feel good now that they children are older. Meyer tries to buy things made in the USA or New England items. The store is not only for people from away, but for friends, family, locals and casual shoppers. It’s for those looking for a birthday gift, or looking to redecorate a room in their home, it’s for those who need something special or those who want to buy a gift certificate and let the recipient choose his or her own unique gift. Meyer is hoping to bring in frames, friendship balls and seasonal products. “I try to be more personalized and will take special orders, requests and feedback,” Meyer said. Items purchased are wrapped in tissue paper and put in a nice bag with the Essentials sticker on it. “You feel good when you leave,” she said. Essentials is located at 1263 Roosevelt Trail and can be found on Facebook under Essentials Gift Shop. The store is closed Sundays and Mondays. Regular hours are 10 a.m. to 5:30 p.m. and on Saturday they close at 3 p.m.